Mesquite is one of the fastest-growing cities in Nevada. Mesa View Regional Hospital in Mesquite NV is a full service hospital - with Inpatient Acute Care services, outpatient surgery and diagnostics, and a 24/7 Emergency Room. Mesquite is home to 7 professional grade golf courses - including the renowned Palmer at Oasis Golf Club! As a real estate agent in Mesquite Nevada with ERA Brokers Consolidated, I have helped many people buy a home and relocate to Mesquite. Everyone has questions and you will have even more after you move here. I hope this answers most of them for you! If you have questions call me at (702) 622-1177 and I will answer them! If you like the outdoors, you can enjoy Mesquite Nevada Walking Trails which are maintained by the city of Mesquite. You can walk or bike along golf courses, scenic desert bluffs or my favorite - the walking trail along the Virgin River, which runs through Mesquite NV. It has a paved walkway with lights that come on at dusk, and you can wander off and make your own trail! Take your dog, if you have one, but be sure to pick up after him. We currently have 3 casino hotels here in Mesquite. They all have very well priced Mesquite golf packages that include golf at one or more of our golf courses and staying in one of the hotels. 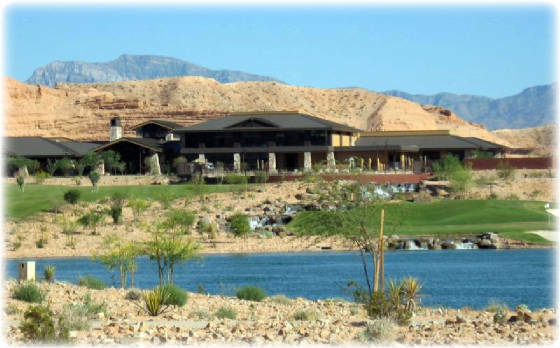 That is a great way to get a Mesquite golfWolf Creek - Mesquite Nevada Golf Course getaway package at a good price - play golf in the daytime and play in the casino in the evening. You might choose a package that has 3 days of golf on 3 different golf courses and 3 nights at a hotel. Don’t stay out too late - you will want to get an early tee time, especially in the summer - it is HOT here. Besides Mesquite casinos for recreation - we have 7 gorgeous golf courses in Mesquite - including the famous Wolf Creek Golf Course - rated by Golf Digest as one of the top 25 courses in the U.S. and the Palmer Golf Course - home of the Big Break. We do have a shuttle to and from the Las Vegas Airport with several departure and arrival times for your convenience. Make a reservation and choose round-trip or one-way if you decide to just stay forever! Cab service, shuttle and city buses are available in Mesquite. If you are looking for a place to park your RV or camper for a day or two or long term, visit this Nevada RV Park Review Website. 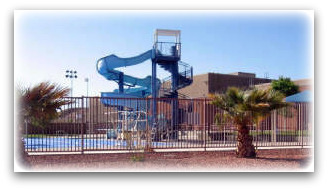 The Mesquite Recreation Center is for families and singles with programs, classes and activities for young and not-so-young. Annual or monthly passes are available to residents of Mesquite. You can even play basketball on the air conditioned indoor court and wait till you see the indoor and outdoor pools! The outside pool is my grandkid's favorite place to go when they visit in the summer. There is also a smaller shallow pool for the almost swimmers and covered picnic areas to get out of the sun and heat. Speaking of Mesquite weather, yes we have some beautiful weather here. Sunny and ‘golfable’ almost everyday! Utilities are very reasonable here - Mesquite NV utilities are all electric - we have no gas here, and the rates are quite a bit lower than Las Vegas. Mesquite water is our own and very inexpensive, from aquifers under the area. You will see water towers all around Mesquite. Even with all of the growth, we currently do not have to ration water like some areas of Clark County do. Cable TV is available or DSL from local carriers. Annual Property Taxes in Mesquite NV and all of Clark County are approximately 1% of the purchase price of homes in Mesquite. Mesquite NV Schools are all in the Clark County School District and includeVirgin Valley High School, Hughes Middle School, and Virgin Valley Elementary School. Bus service to and from the school is provided for the kids. Seniors - Mesquite is an active adult kind of town with a Mesquite Senior Center - if you are not interested in going to a casino or playing golf, the city of Mesquite sponsors activities and programs just for seniors. We have several active adult community subdivisions for 55 plus residents and second home owners. Speaking of active adult communities in Mesquite - Pulte Del Webb Sun City Mesquite opened in 2007. With aSun City Mesquite NV Recreation Center - 50 - 55+ Golf Course Community large selection of Sun City Mesquite floor plans and prices - there is enough variety to make it the best selling Del Webb community in not just Nevada, but in the whole U.S. and the best selling new home subdivision in Mesquite. The Sun City Mesquite Pioneer Recreation Center is amazing, with a beautiful indoor pool which is open year round and a huge outdoor swimming pool and spa that overlooks their Conestoga Golf Course. Now that they have been open for over 2 years, there are some Sun City Mesquite Resale Homes available - many are upgraded, some have been rarely used. Membership to the Rec Center with fitness center, billiards room, putting greens, tennis courts and activitiesis included with their HOA monthly fee. Residents in Sun City also get a discount and preferred tee times at the Conestoga Golf Course which is now open. 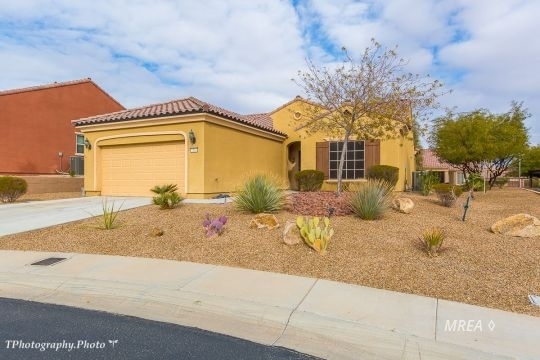 Sunset Greens in Mesquite NV is another gated golfcourse community of single family homes and townhomes - all with 2 car garages and fenced backyards. With 2 swimming pools, one for adults only, and pet friendly walking paths throughout the subdivision, it is a desirable community for a home or second home. The Homeowners Association takes care of all of the outside maintenance - more time to enjoy the Casablanca Golf Course discount that is included in the low HOA fee of $140 per month. Or just sit on your covered back patio and enjoy the golfcourse and mountain views. 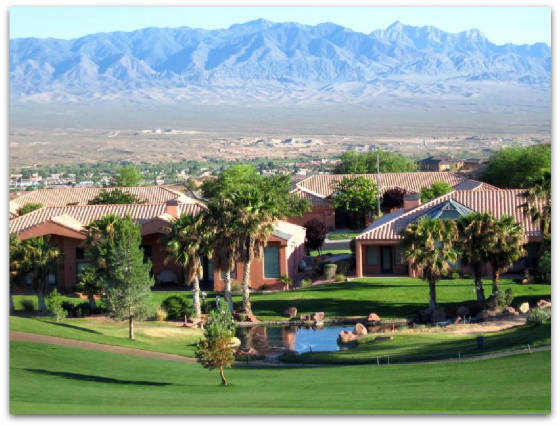 Mesquite has several gated communities on the golf courses - homes for sale right on the golf course, some homes with views of the golf courses and other homes with beautiful views of Mesquite and the mountains. Copper Bluffs has some reasonably priced homes for sale in a Mesquite NV gated community with membership priveledges at the Oasis Golf Club. 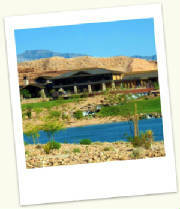 If you would like an idea of what homes are for sale in Mesquite NV, you can search Mesquite NV MLS right now. 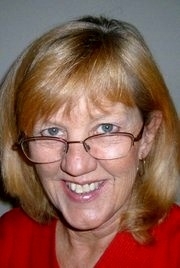 If you see a property that interests you, call or email me and I will give you more information. Here is a place to start for information about buying a Mesquite NV foreclosure or Mesquite Nevada short sale property.